Released in North America and Europe as Bust-A-Move. Game runs directly off of the disc, uses Redbook audio for music. Music will now loop correctly, and will play on cue 100% of time as side effects to this fix. Copy all of the files from the disc into a folder of your choosing. Open your game CD in any application that rips audio CDs, and rip the audio into an easy to find place, preferably into a new folder in the game’s directory. Open _inmmcnf.exe, and on the "Method" tab, change the "default" option to DirectShow. Go to the folder you ripped the game's music into. Then select all of the "track" files. 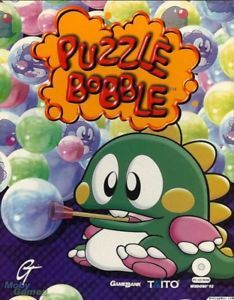 Select "Save", go to the folder you installed Puzzle Bobble/Bust-A-Move in, then save the ini file. Close _inmmcnf.exe, then drag pb.exe onto the _inmmcnf.exe file itself. This will pop up a message asking if you want to patch the executable. Select "Ok". Launch loader.exe whenever you want to play the game, or launch pb.exe to skip the launcher. Locked at 320x240 and 640x480 in fullscreen mode. Needed to navigate game options. Mouse needed to navigate game options. BGM and SFX on/off only. Serial, Modem, and Direct IP only.